Convert DVDs, videos and aduios to iPhone video and audio formats on Mac. 1. Intel processor. 2.Mac OS X 10.5 or Later 3. 512 MB physical RAM (memory) or more. 4. Fully compatible with iPhone 4 and iOS 4. 5. Convert videos and DVDs for watching on-the-go with iPhone, iPhone 4, iPhone 3GS, iPhone 3G. 9. 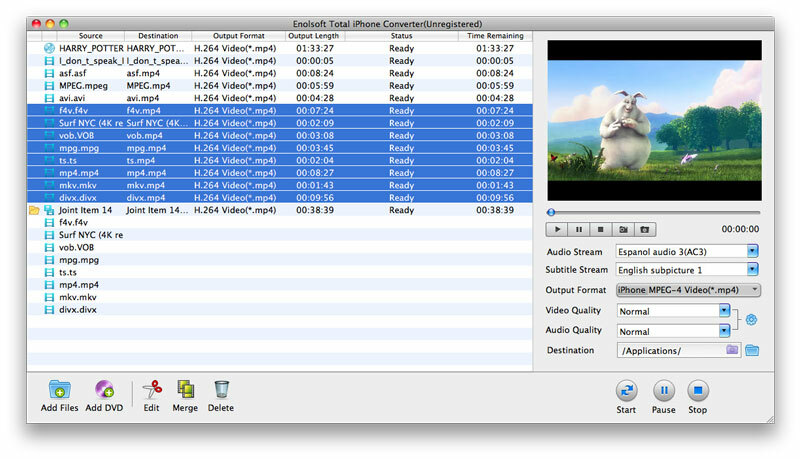 Convert AVCHD (*.mts, *.m2ts) to iPhone MP4, MOV, M4V video formats on Mac. 11. Fully compatible with Mac OS X 10.6 Snow Leopard on iMac, MacBook, Macbook Air, Mac Pro etc. Qweas is providing links to Enolsoft Total iPhone Converter for Mac 3.2.0 as a courtesy, and makes no representations regarding Enolsoft Total iPhone Converter for Mac or any other applications or any information related thereto. Any questions, complaints or claims regarding this application Enolsoft Total iPhone Converter for Mac 3.2.0 must be directed to the appropriate software vendor. You may click the publisher link of Enolsoft Total iPhone Converter for Mac on the top of this page to get more details about the vendor.